Kerry On Holy Site In Jerusalem: 'We're Not Seeking Outsiders Or Others To Come In' : The Two-Way Kerry appeared to push back against a French proposal calling for an international presence at the holy site in order to preserve the status quo agreement. Israel is against the proposal. 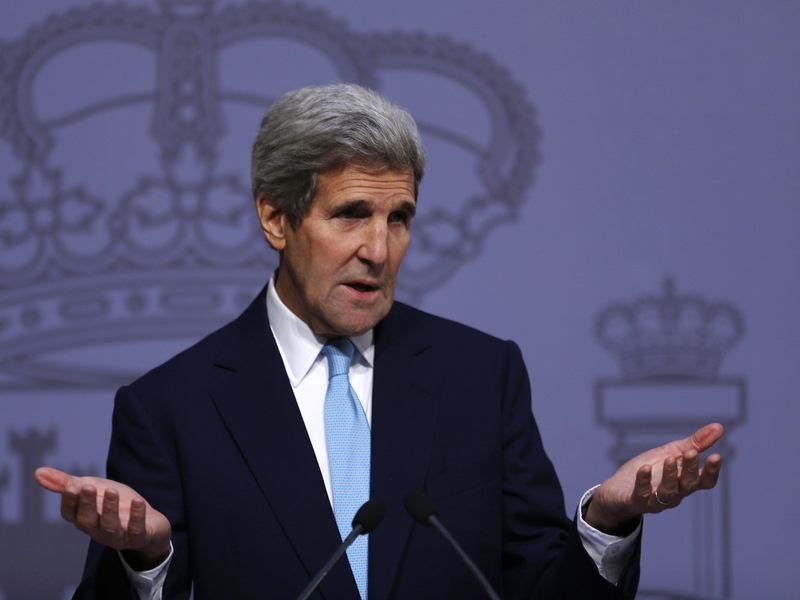 U.S. Secretary of State John Kerry speaking at a news conference in Spain. Kerry will attempt to strike the right balance in separate meetings later this week with Israeli and Palestinian leaders. Ahead of his meetings with Israeli and Palestinian leaders this week, U.S. Secretary of State John Kerry has urged both sides to exercise restraint and called for clarity on the status of a holy site in Jerusalem that's been at the epicenter of the uptick in Israeli-Palestinian clashes in recent weeks. "Israel understands the importance of that status quo, and I think what is necessary perhaps – which is why diplomacy sometimes enters into this – is to make sure that everybody understands what that means, that there is clarity as to what the expectations are." The status quo at the holy site allows for Jews to visit, but not pray there. "We're not seeking outsiders or others to come in. I don't think Israel wants that.... and we're not proposing it. So let me make clear: What we need is clarity. We need to have all the parties come together with an expression of that clarity. And I feel strongly that it's in the interests of everybody to be able to do so," Kerry said. According to the Times of Israel, Prime Minister Benjamin Netanyahu has also come out against the proposal. Kerry announced over the weekend he would be meeting separately with both Netanyahu and Palestinian President Mahmoud Abbas this week. As the Two-Way reported Sunday, the meetings come during a surge in violence in the region. While in Madrid, Kerry also solidified an agreement with Spain's Foreign Minister Jose Manuel Garcia-Margallo Monday to further discuss the cleanup and removal effort of toxic land on the Spanish coast. The land is reportedly contaminated with radioactivity after a mid-air collision in 1966 dropped four U.S. hydrogen bombs near Palomares, a southern Spanish village. According to the wire service, the agreement calls for the two countries to arrange for the disposal of the contaminated soil at a site within the U.S.
"In a joint press conference in Madrid, Margallo said the process would begin soon but gave no details. "The bombs were released on Jan. 17, 1966, when a U.S. B-52 bomber and a refueling plane crashed into each other during a routine refueling operation, killing seven of 11 crew members. There were no fatalities on the ground. "None of the bombs exploded, but the plutonium-filled detonators on two went off, strewing 7 pounds (3 kilograms) of highly radioactive plutonium 239 across the landscape around the southeastern town. "The accident occurred at the height of the Cold War when it was U.S. policy to keep nuclear-armed warplanes in the air constantly near the Soviet border."